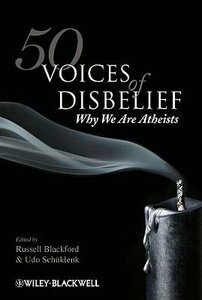 50 Voices of Disbelief: Why We Are Atheists presents a collection of original essays drawn from an international group of prominent voices in the fields of academia, science, literature, media and politics who offer carefully considered statements of why they are atheists. About "50 Voices of Disbelief: Why We Are Atheists"
Udo Schklenk (Ph.D., Monash University, Australia) is a German-Australian philosopher. He has written or edited five books and published over one hundred articles in peer reviewed journals and books. His latest books are the co-edited volumes The Power of Pills (2006) and The Bioethics Reader (Blackwell, 2007). He is the Joint Editor-in-Chief of the international journal Bioethics and currently the Ontario Research Chair in Bioethics at Queens University in Canada. His current research focuses on ethical and policy issues in drug research and development. Acknowledgments. Introduction: Now More Important Than Ever - Voices Of Reason ( Russell Blackford And Udo Schuklenk ). Unbelievable! ( Russell Blackford ). My "bye Bull" Story ( Margaret Downey ). How Benevolent Is God? - An Argument From Suffering To Atheism ( Nicholas Everitt ). A Deal-breaker ( Ophelia Benson ). Why Am I A Nonbeliever? - I Wonder ... ( J. L. Schellenberg ). Wicked Or Dead? Reflections On The Moral Character And Existential Status Of God ( John Harris ). Religious Belief And Self-deception ( Adele Mercier ). The Coming Of Disbelief ( J. J. C. Smart ). What I Believe ( Graham Oppy ). Too Good To Be True, Too Obscure To Explain: The Cognitive Shortcomings Of Belief In God ( Thomas W. Clark ). How To Think About God: Theism, Atheism, And Science ( Michael Shermer ). A Magician Looks At Religion ( James Randi ). Confessions Of A Kindergarten Leper ( Emma Tom ). Beyond Disbelief ( Philip Kitcher ). An Ambivalent Nonbelief ( Taner Edis ). Why Not? ( Sean M. Carroll ). Godless Cosmology ( Victor J. Stenger ). Unanswered Prayers ( Christine Overall ). Beyond Faith And Opinion ( Damien Broderick ). Could It Be Pretty Obvious There's No God? ( Stephen Law ). Atheist, Obviously ( Julian Baggini ). Why I Am Not A Believer ( A. C. Grayling ). Evil And Me ( Gregory Benford ). Who's Unhappy? ( Lori Lipman Brown ). Reasons To Be Faithless ( Sheila A. M. Mclean ). Three Stages Of Disbelief ( Julian Savulescu ). Born Again, Briefly ( Greg Egan ). Cold Comfort ( Ross Upshur ). The Accidental Exorcist ( Austin Dacey ). Atheist Out Of The Foxhole ( Joe Haldeman ). The Unconditional Love Of Reality ( Dale Mcgowan ). Antinomies ( Jack Dann ). Giving Up Ghosts And Gods ( Susan Blackmore ). Some Thoughts On Why I Am An Atheist ( Tamas Pataki ). No Gods, Please! ( Laura Purdy ). Welcome Me Back To The World Of The Thinking ( Kelly O'connor ). Kicking Religion Goodbye ... ( Peter Adegoke ). On Credenda ( Miguel Kottow ). "not Even Start To Ignore Those Questions!" A Voice Of Disbelief In A Different Key ( Frieder Otto Wolf ). Imagine No Religion ( Edgar Dahl ). Humanism As Religion: An Indian Alternative ( Sumitra Padmanabhan ). Why I Am Not A Theist ( Prabir Ghosh ). When The Hezbollah Came To My School ( Maryam Namazie ). Evolutionary Noise, Not Signal From Above ( Athena Andreadis ). Gods Inside ( Michael R. Rose And John P. Phelan ). Why Morality Doesn't Need Religion ( Peter Singer And Marc Hauser ). Doctor Who And The Legacy Of Rationalism ( Sean Williams ). My Nonreligious Life: A Journey From Superstition To Rationalism ( Peter Tatchell ). Helping People To Think Critically About Their Religious Beliefs ( Michael Tooley ). Human Self-determination, Biomedical Progress, And God ( Udo Schuklenk ). About The Contributors. Index.